As a software developer in the late 90’s, I encountered VMware Workstation as a solution to the "aww, man, that bug goofed up my configuration" problem. I had used the product as a sandbox for testing software or developing installation and configuration documentation: step-by-step processes with screenshots. Fast forward to 2002, we had a test lab built for our Netware/NDS to Windows 2000/AD migration project. The hardware consumed 2 full 42U datacenter racks and made quite a bit of noise. We installed VMware GSX on one machine and reduced the hardware footprint of our test lab to something closer to 15U of gear, including the tape drive used to back the environment up. The lab room became so much quieter (and cooler!) that you could barely tell the gear was powered up. Based on that success, we looked at ESX 2.0 as an even more efficient way to consolidate, and started looking at moving some low-impact workloads from old hardware into VMs on newer hardware. With the advent of VMotion (capital ‘V’ back then) then HA and DRS in VI3, we were able to accommodate production workloads by addressing the ‘all of your eggs in one basket’ problem. Adoption of the platform simply took off from there. I had moved from a customer to a VMware partner at this point. I actually credit my interest in consulting to my involvement with VMware. Based on some interactions on the VMware forums that turned into in-person Q&A sessions, I realized that I enjoyed that part a lot more than operational maintenance and carrying a pager. At the time, in late 2007 or early 2008, there was no VMware certification beyond the VCP. I was talking with a coworker, Mark Gabryjelski — he’s got a crazy-low VCP number (#46) — about the value of some kind of advanced VMware certification that would help further differentiate the people who really focused on this technology and its application. 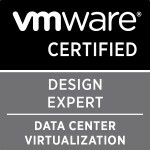 A quick visit to the certification section of VMware’s website revealed that VMware was creating a new Design certification called VCDX. Right there, we challenged one another to become part of the program as a way to validate our skills, help differentiate the company, and ultimately help shape the certification itself. We saw it as becoming even more involved with the growing VMware community. I filled out a ‘skills assessment’ on the website in Q1 of 2008, and received an invitation to take the "VMware Enterprise Administration Exam." After passing that exam, I was invited to take the "VMware Design Exam" in Q1 of 2009. At the end of July 2009, I was notified that I had passed the second exam and that there were going to be VCDX Defense opportunities at VMworld 2009. In order to get in to that group, I had to have my application completed by August 14, so, I had roughly 2 weeks to complete my application, design and design documentation. Fortunately, I was able to work things out and was able to complete my documentation AND reserve a slot for the defense. I was notified that I had passed on September 1, 2009, so the whole process took a little shy of two years for me. If you’re even considering it, get started now. Do some research and find out if it is something you really want to do. There is a lot of information about VCDX out there — blueprints, blog posts, workshops, even sessions at Partner Exchange and VMworld that walk you through the process. I’ve even presented a session at VMUG about it. I don’t think any of the VCDX certified individuals, or the people who run the VCDX program, are secretive about how the process works and what it takes to pass. As long as you don’t ask us something that would violate our NDA, most of us are pretty open to talking about it. To get started down the path, get the blueprints for the VCAP exams, get them scheduled, and take a look at what is required for a VCDX-level design. If you’re not building your designs that way today, start using the guidelines to make your current work that much better. As an added benefit, this gives you plenty of practice towards building the documentation for your application and defense. Don’t rush the process, but don’t be afraid of it, either. Once you have your defense scheduled, make sure that you know your design. Not just the, "here’s how we built it," but the "why did you choose to build it that way" aspects. Understand how your customer’s requirements and constraints shaped the design — be able to explain the WHY. Once you get to the defense, relax and have fun with it! I don’t think I would have done much different. I was fortunate to be working with a great customer at the time my defense was scheduled. They agreed to answer all kinds of crazy questions, and provided me with excellent feedback that helped me solidify the design and get everything straight in my head. Having that kind of support from my customer was amazing. I strongly recommend using a real design for your defense and reviewing it with the actual customer or coworkers/peers who can ask you tough questions about it. I received accolades from the local VMware team as well as recognition from my company, both internally and at events we sponsored. In the early days, nobody knew what a VCDX meant, so I had to explain what it was at just about every event — my apologies to those who had to hear me say the same thing multiple times! Today, the situation is better, and more people understand what VCDX means, although we do have a ways to go before it achieves the widespread recognition of, say, CCIE. Categories: Certifications, VCDX | Tags: VCAP, VCDX, VCDX5, Virtualisation, virtualization, VMware | Permalink.